Timber Products Inspection (TP) not only assures the quality of solid-sawn lumber, but we also oversee the production of finger jointed lumber. In addition to traditional lumber grading practices, finger jointed lumber is subject to stringent quality control requirements including regular in-plant testing to assure strong, reliable joints. Manufacturers sample production several times each shift and test for bond strength and adhesive durability. Structural finger joints must exhibit strength values more than twice the design value for the grade. What are the two types of finger joints? Vertical Use Only – A Vertical Use Only joint has the primary purpose of resisting compression loads. Also labeled Stud Use Only, these joints are usually 3/8” to 5/8” long and often have blunt tips. The adhesives used are water resistant, but Vertical Use Only lumber is only certified for indoor use. 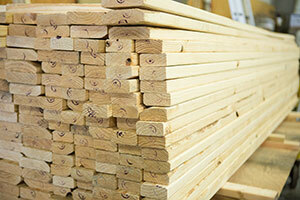 These boards are available in sizes up to 2x6 and in lengths up to 12’. Certified Exterior Joints – Lumber with Certified Exterior Joints are not restricted to any type of loading. The joints usually have 7/8” to 1-1/8” long fingers, and the adhesives used are waterproof and creep resistant. This joint can be used in any width or length recognized under the American Lumber Standard Committee’s National Grade Rule. What are the benefits of structural finger jointed lumber? Can be used interchangeably with solid-sawn lumber as described above. Requires approved agency quality control and grading. Warps in shorter segments which reduces overall warp. Is available in longer lengths for certified exterior joints. Is produced in a wide variety of species and sizes. Upgrades often-wasted short lumber into structural products. Provides an important source of the highest quality, most reliable building material – renewable wood. TP also audits the quality of GluLam beam manufacturers. Similar to finger jointed lumber production, GluLam production requires daily quality control by the plant to test the shear strength of the face bonds, the tensile strength of the finger joints, and the glue bondline durability, in addition to other attributes that require ongoing testing as well. TP now has seven DSA Certified Glulam Inspectors approved by the Division of the State Architect (DSA) for the state of California.